Here are some things that I purchased at CVS and Rite Aid. Rite Aid was having a buy one, get one half off for Wet n Wildcosmetics so I decided to try out their new lipsticks since I've heard good things about them. 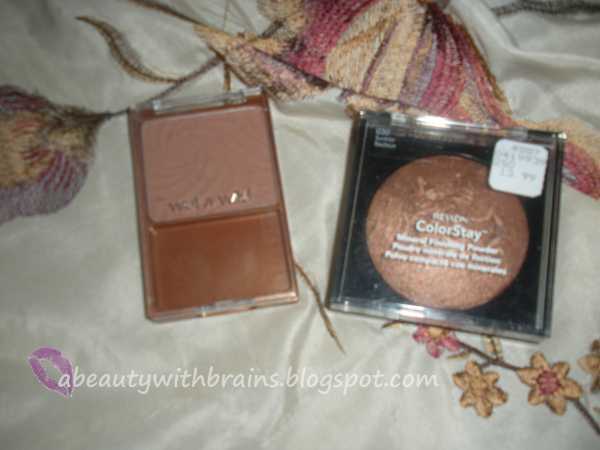 I also got a new Revlon Mineralizing Powder and Wet n Wild bronzer. I really like the Revlon mineralizing powders, I already have one in "Suntan Matte" and I love that they add a nice subtle glow to your face sine they have a small hint of shimmer. I like to set my makeup with it but I've been looking for another powder to set my makeup with for a matte look. I'm open to any suggestions you ladies might have. 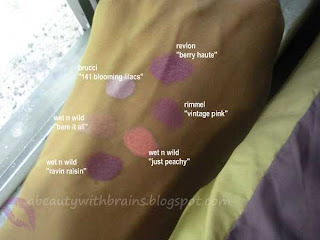 So here are some swatches and reviews of the lippies I purchased. I also bought a lipstick from Revlon, Brucci and Rimmel. I've included reviews for them also. Hope you find these helpful. I am wearing Just Peachy in EOTD & Tutorial: Gold Rush. I'm wearing Vintage Pink in Aventura Concert! And now the reviews..I did them by brand. I finally made a watermark for my photos that I can use regularly. I want to thank PiinkCupcakez for all her help. She gave me the steps via Twitter which was really nice of her. Isn't it great how everyone helps one another? 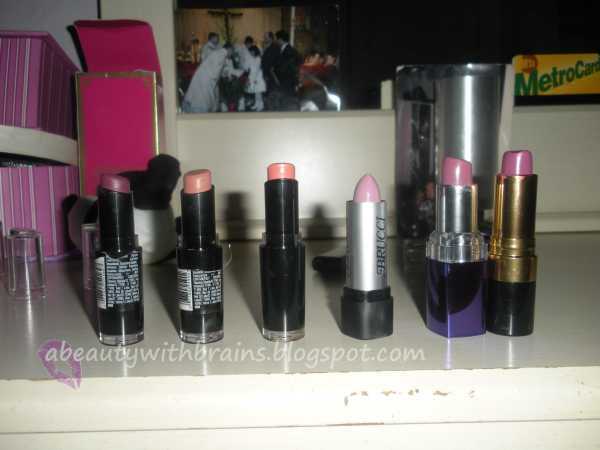 the lipsticks look so nice.. i wanna get "just peachy"
and how is the wet n wild bronzer? I really like the bronzer, I use it to contour and it it's easy to work with and it's not orangey at all. Berry haute is my favorite. I did not like the wet n wild lipsticks too dry for me. But the colors are great. Did you get to see N.Y.C'S limited edition matte bronzer? I may get it soon. lovely haul. I'm really loving the wet m' wild lippies! I've been wearing them everyday since I got 'em! thnks everyone for the lovely comments! Oh my God! I have that revlon color stay, but in pink. Absolutely loved it! Awesome site!